The different people have different life habbits ,so it is hard to explain this things ,maybe they think it 's interesting ,or they think they have riding for many times.There is no dangerous things . My gf is 65 and I am 72. I am an ex-college athlete (football & baseball). She never even thought about sports. I have always hated training. She goes to the gym everyday and often does multiple activities like Body Pump followed by a Spin class. We started riding together 14 years ago. I had ridden for over 20 years but was coming off an 8 year layoff. She was new to the bike. In the beginning, thanks to 20 lbs I had gained, I would struggle up hills behind her then power past her rather easily. We'd always be within sight of each other. I would not try to "win." The rides had a bit of a yo yo quality to them. Over the years she has gotten into mega shape and has lost about 10% of her body weight. She is now down to 125 lbs. While she was losing weight, I was losing height. I'm down 2". But. I'm also close to my college weight of 185 lbs. From non-athlete she has become a very good cyclist. I have lost a lot of strength but am more fluid than ever on the bike. These days I still chase her up hills although I am often right behind her. On the flats I can still power up. She is right on my wheel. For example....2 days ago we got to a 3 1/2 mi. flat and winding Strava segment. I told her I was "going for it." I finished with a PB of 20.4 mph. She was on my wheel asking "Do you want me to take a pull?" These days our rides are "together" so we don't have to wait for each other. If we do, it's her at the top of a long climb with me 15-20 seconds behind. My rule has always been that whether she was in front or behind, I would not let her be out of sight. Today that's not a problem.We ride with a club in their B ride and I ride solo often including a 6.4 mi. TT I have to measure my fitness. But, the best rides I have are with her. If they do this regularly, they have an agreement, if he did it without any agreement, she won't be riding with him again. Presumably, they both have cell phones in case of trouble. And needing help can go both ways. I did a very long ride last Saturday. By far, the best solo rider I saw out in hill country was a woman who absolutely shredded the 9% grade. There's no reason to assume a need for the husband to protect his wife from mishap. Someone with the riding skills that woman had would clearly be able to fix her own flats or whatever. People have limited time to ride during the week. This might be the only time they have to put the hammer down, and they just plan on meeting up at the end. Yeah, this. Judging the husband adversely for this is about as reasonable as judging the wife, when the two are together, as a dependent female in need of a protector 24/7; neither is reasonable. So nice for a partner to have the same hobbies. There should be no comprehensive understanding of the truth of the matter. 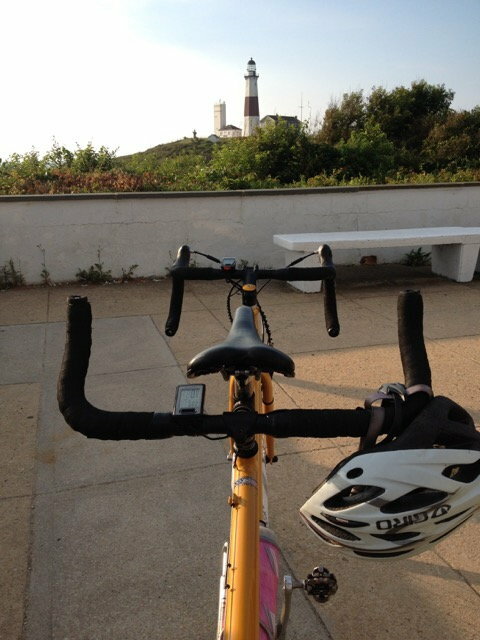 The bottom photo with the yellow bike is of the Montauk Point lighthouse. 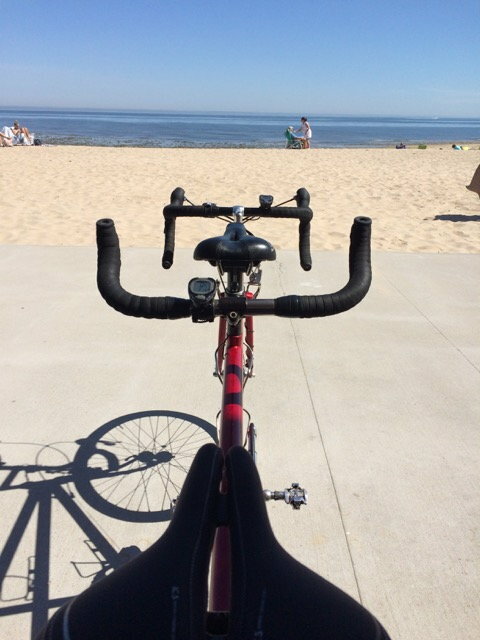 The other, with the red bike, was taken at Crab Meadow beach in Smithtown, looking north at a dimly visible Connecticut coast on the horizon. That's just bad logic. I hope she thinks more clearly on more important topics. One of the things I like about my wife is that she doesn't slow herself down when she's stronger than I am, and she doesn't ask me to slow myself down when I'm stronger than she is.